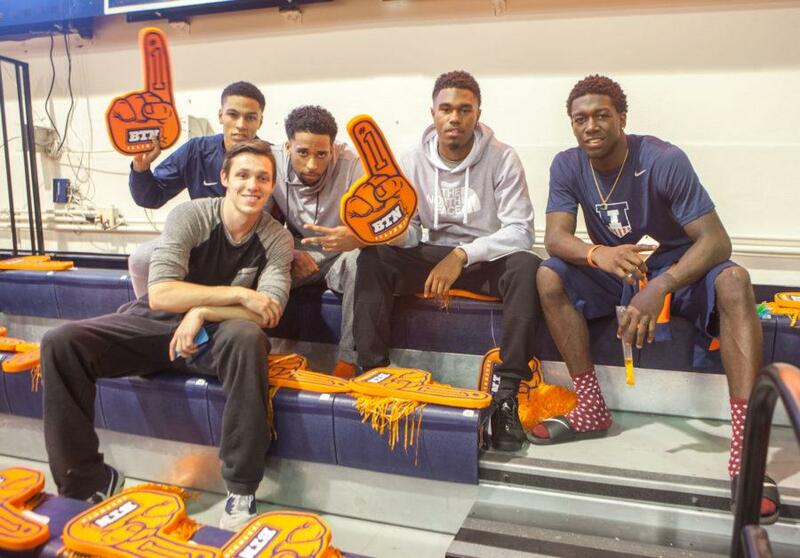 Illinois basketball players (top left) Khalid Lewis, (bottom left) Mike Latulip, (middle) Alex Austin, (second from right) Jaylon Tate and (right) Kendrick Nunn cheer on the women's volleyball team during their game against Penn State on Friday at Huff Hall. On the precipice of being swept at home Friday night, the Illinois volleyball team (11-5) found its game, if only for a moment. Penn State (15-2) had its way for the majority of the match and looked to put the No. 13 Illini away in the third. But with match point at 24-21, outside hitter Jocelynn Birks started an Illinois rally of five-straight points that kept the team in the match for a while longer. The third set victory represented the kind of play both the players and head coach Kevin Hambly hoped to see throughout the weekend. Illinois dropped two home matches, both in four sets, to Big Ten rivals No. 3 Penn State (25-16, 25-18, 24-26, 27-25) and No. 9 Ohio State (25-20, 24-26, 25-18, 27-25). Illinois came into the weekend looking to bounce back after two road losses that ended the team’s month-long absence from Huff Hall. The home fans greeted their team back with “IlliNOISE” night Friday and packed the gym. Outside hitter Michelle Strizak said the team fed off the energy of the crowd, but the excitement might have taken the team out of its rhythm. Illinois’ frantic play in the first two sets allowed for Penn State to control the match from the start. Hambly said the team simply had no answer for the Nittany Lions offense, which was led by Megan Courtney’s and Aiyana Whitney’s 18 and 16 kills, respectively. And even though the Illini were able to find a rhythm in the third set, the team couldn’t sustain it for the majority of the fourth. Against Ohio State (16-2), Birks said the team played with more “heart” but still needs to work on making the extra passes and covering teammates. Illinois tied the match with a 26-24 victory in the second set, highlighted by a powerful block from Ali Bastianelli and Naya Crittenden. But the team once again couldn’t capitalize on the momentum and allowed the Buckeyes to take the next two sets. Hambly said the team is missing a defensive identity, which is something his teams typically thrive on. Both weekend opponents managed to hit above .200 in each of their four respective sets against Illinois, but the Illini offense was able to hit that mark in four sets over the course of the entire weekend. The weekend losses have pushed Illinois’ losing streak to four games, which according to Birks, has been frustrating for the players. She said the key for the team is to learn how to maintain its strong play throughout the match and not to get rattled by its opponents. Hambly said he is keeping the season in perspective given that in its last four games Illinois played four top-20 teams. Going into another full week of practice, he will push his team to sustain the high level of play necessary to compete in the Big Ten.